The 2018 Pirelli World Challenge season is the twenty-ninth consecutive year for the championship. There are four race weekends (eight races). This was quite a contrast to 2017 when Grand Touring Sport competitors raced in eighteen events to determine the champion. The Grand Touring Sport category title chase kicks-off in March at Saint Petersburg. This event is followed by races at Canadian Tire Motorsport Park and Road America. The finale takes place at Watkins Glen International on the Labour Day weekend. Grand Touring Sport (GTS) – The cars in this group are similar to the Grand Touring vehicles but have more preparation restrictions. Drivetrain layouts include all-wheel-drive and front and rear-wheel drive. These cars may be powered by forced induction or normally aspirated motors. In previous years, the Grand Touring Sport class was mainly comprised of Ford, Chevrolet and Porsche products. In 2016, this category witnessed an influx of FIA GT4 vehicles which proved to be very competitive – Porsche Cayman GT4 Clubsport, KTM Xbow GT4, Ginetta G55 GT4, Audi R8 LMS GT4, Chevrolet Camaro GT4.R, Ford Mustang GT4, BMW M4 GT4, McLaren 570S GT4, Panoz Avezzano GT4, Mercedes-AMG GT4, Maserati Gran Turismo MC GT4 and SIN R1 GT4. Grand Touring Sport Amateur (GTSA) – This class was introduced in 2017 and is created to accommodate drivers that are not considered professionals. However, competitors in this group are evaluated after each event and based on their performance may be elevated to the Grand Touring Sport category. Only GT4 homologated cars will be allowed to compete in the Grand Touring Sport category. Within their class, drivers are eligible to score points towards three championships – Sprint (fifty-minute races), SprintX (sixty-minute contests) and Overall (combined points scored in the Sprint and SprintX events). 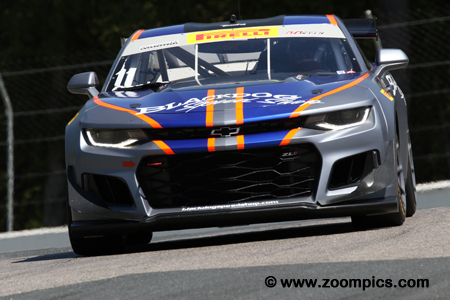 Rounds three and four of the 2018 Pirelli World Challenge championship for the Grand Touring Sport cars was held at Canadian Tire Motorsport Park (CTMP). Drivers would compete in two fifty-minute sprint races around the ten-turn 2.459-mile road course. 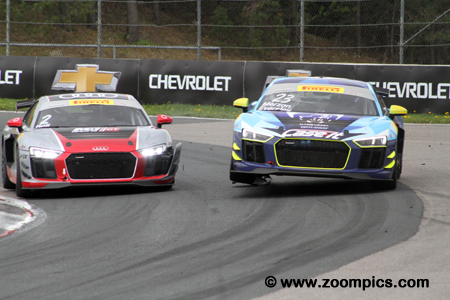 Corner two at Canadian Tire Motorsport Park and the first lap of round three of the Pirelli World Challenge series. Leading the way is the pole-sitter, Ian James in the Panoz Avezzano GT4. 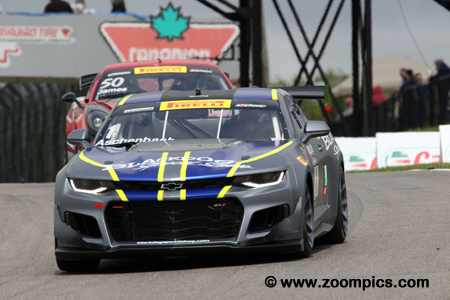 However, James will lose the lead before turn three to the fastest qualifier, Lawson Aschenbach driving the Blackdog Speed Shop Chevrolet Camaro GT4. A total of twenty-three GTS competitors started Saturday’s event. Four races and four wins for the defending GTS champion, Lawson Aschenbach. Aschenbach driving the Blackdog Speed Shop Chevrolet Camaro GT4 was victorious in the opening rounds of the season at the Grand Prix of Saint Petersburg. 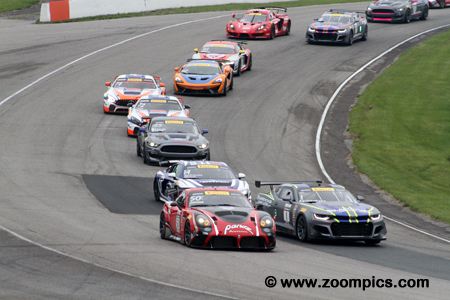 At Canadian Tire Motorsport Park, he qualified third in the weekend’s first event but led flag-to-flag. On Sunday, Aschenbach started on the pole and led the entire thirty-two-laps. Jade Buford driving with Scott Maxwell won the opening round of the SprintX series at Circuit of the Americas. In the weekend’s first event, Buford put the PF Racing Ford Mustang GT4 fourth on the grid but was in the runner-up position at the checker. On Sunday, he started fifth and captured the final spot on the rostrum. Despite not scoring any points in round one at Saint Petersburg, Buford is fourth in the standings. 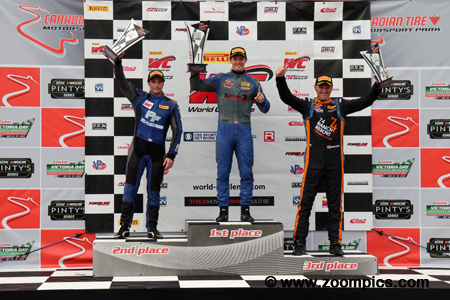 The round three Pirelli World Challenge GTS podium at the Canadian Tire Motorsport Park. On the right is the third-place finisher, Shane Lewis. To the right is the runner-up, Jade Buford. Between these two drivers is the winner for the third time this season and defending class champion, Lawson Aschenbach. It was a weekend of mixed emotions for Mark Klenin – he experienced the highs and lows of racing. 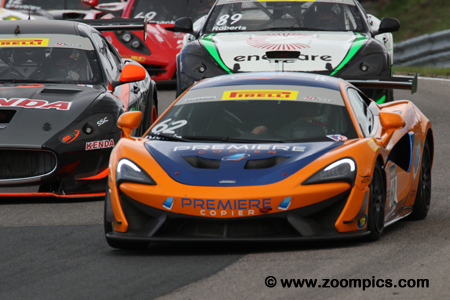 On Saturday, Klenin driving the KPR/Premiere Copies McLaren 570S GT4 qualified second in GTSA but jumped into the lead and took the class victory by just 0.142-seconds. This was his second series win. In round three, Klenin was in contention but went wide at turn three on lap-18 and crashed the car – he finished last. In 2017, Fred Roberts replaced his Dodge Viper with a Maserati Gran Turismo MC GT4. 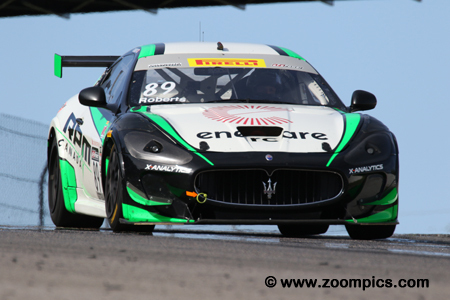 But Roberts’ season ended at Mid-Ohio when contact with another competitor severely damaged the Maserati. This year did not get off to a great start and he was unable to start round one. At his home track, Roberts’ luck turned around. On Saturday, he captured the runner-up position in GTSA and in race four, he was third in class. A suspension failure on the right-rear of the No. 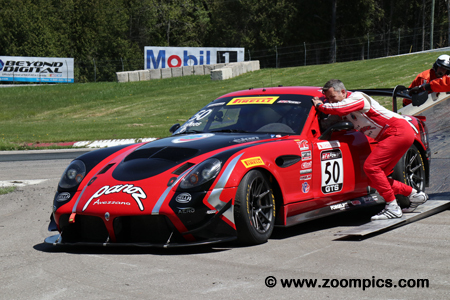 50 Panoz Avezzano GT4 forced Ian James to park the car at Moss corner during Saturday’s practice session. Despite this setback, James qualified on the pole for round three. Unfortunately, he was unable to hold-off, Lawson Aschenbach and finished second. It appeared, he would grab another runner-up finish but the Panoz failed post-race tech and was disqualified. 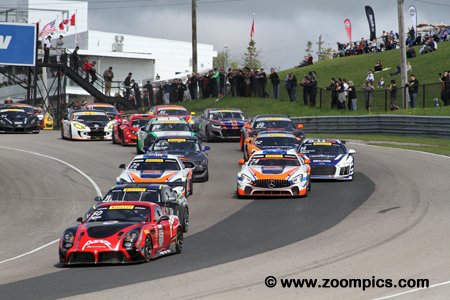 The start of round four for the Pirelli World Challenge GTS category at Canadian Tire Motorsport Park. The second place starter, Ian James driving the Panoz Avezzano GT4 jumps into the lead. But James would not hold on to the first place for very long. The pole-sitter, Lawson Aschenbach would move around him and take the victory. After a couple of seasons in the Tran-Am series, Shane Lewis returned to World Challenge competition with the Robinson Racing team. Lewis scored a pair of top-ten finishes in the opening rounds at the Grand Prix of Saint Petersburg. 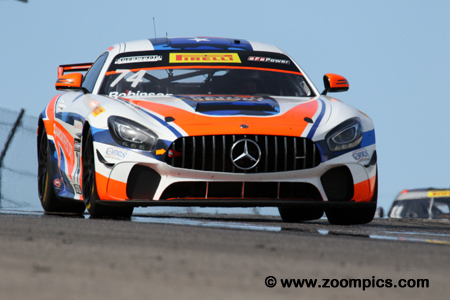 Canadian Tire Motorsport Park appeared to suit Lewis and the Mercedes-AMG GT4 he was driving. A second place finish on Saturday gave him his first podium of the year. Based on his results in the opening rounds at Saint Petersburg it appeared that Drew Staveley was in the wrong category. In races one of the season, Staveley took the GTSA win and finished third overall. 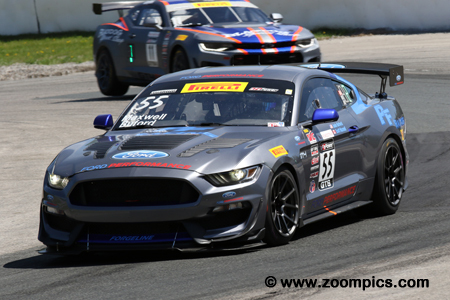 He qualified and finished sixteenth in Saturday’s event at CTMP. The following day, Staveley was gridded seventeenth but moved into contention and passed the Maserati’s of Courtney and Roberts for the class victory. Jeff Courtney had an off-course excursion at corner two during the wet qualifying session and damaged his Maserati Gran Turismo MC GT4 but was able to continue. Courtney started round three in the eighteenth grid position and finished twelfth overall and fifth in GTSA. On Sunday, he appeared headed for the class victory but was unable to hold off the hard-charging Ginetta G55 of Drew Staveley. Pirelli World Challenge veteran, Tony Gaples finished on the GTSA podium – third place – in race two at Saint Petersburg. 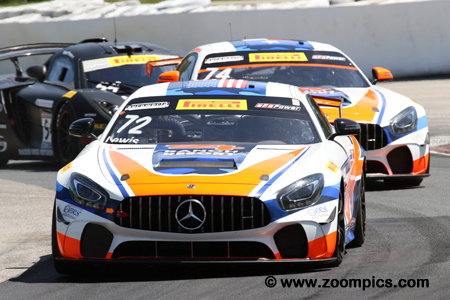 In the GTS SprintX division, Gaples was paired with Michael Cooper. The duo had a podium finish at Circuit of the Americas. 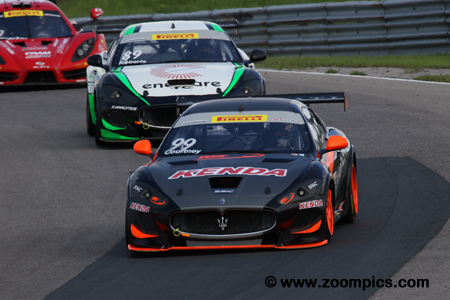 At Canadian Tire Motorsport Park, he finished third and fifth in class. Gaples combined results to date placed in fifth in the combined title chase and second in GTSA. On the last lap of round four, in corner ten, Jason Bell attempted an aggressive pass for position on Adam Merzon. The two Audi’s made contact damaging the left rear of Merzon’s car. They were able to continue with Bell finishing twentieth and Merzon twenty-first. After the race, Bell was penalized one position by the Stewards which reversed the final results for these two drivers. Gar Robinson the 2015 and 2017 Trans-Am TA2 champion made his Pirelli World Challenge debut in round one at St. Pete. 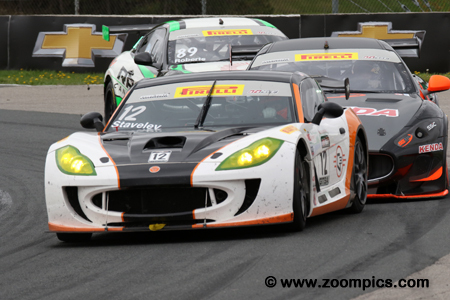 In the GTS SprintX category, he was paired with his teammate, Shane Lewis. The duo was yet to score a podium finish but that was about to change at CTMP. Robinson qualified fifth and finished sixth in the weekend’s first event and on Sunday he grabbed the runner-up spot. 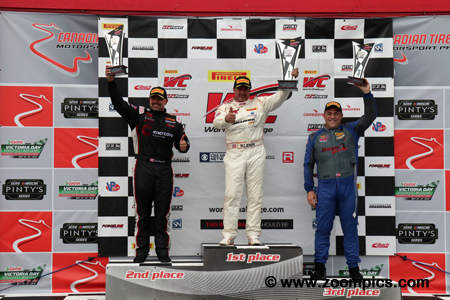 The round three Pirelli World Challenge GTSA podium at the Canadian Tire Motorsport Park. On the right from Blackdog Speed Shop is the third-place finisher, Tony Gaples. To the right is the runner-up, Fred Roberts who was making his first World Challenge podium appearance. Between these two drivers is the winner for the second time in his Pirelli World Challenge career, Mark Klenin.